BART has had mixed land use and development effects on the San Francisco. BART was the first American rail rapid transit system to be built in modern times, and its arrival was greeted with worldwide attention. BART is famous. Its fame is attached to its favorable image as the answer to the problems of the modern American metropolis. And the extent to which it has succeeded, or failed, to live up to expectations is an important lesson for other cities wanting to emulate it. BART is now middle-aged and certainly widely recognized as a part of the San Francisco Bay Area, but is it an important part? Do people in the Bay Area live and work in different locations and in different ways than they would if BART were not there? Can we point to housing projects, office buildings, shopping centers, or public buildings that would not have been built, or neighborhoods that would not have been revitalized but for BART’s presence? Does BART provide more people with more accessibility to economic and social opportunities than they would otherwise enjoy? Would the Bay Area without BART be the same place it is today? The answers to these questions may be more important today than in 1962, when BART’s construction was approved by voters in Alameda, Contra Costa, and San Francisco counties. If, as many city planners and transit advocates believe, transit investments like BART can substantially alter metropolitan development patterns, then transit’s role as “growth shaper” should be explicitly considered when making transit investment decisions. If, on the other hand, transit’s effects on growth and urban form are only marginal, then decisions regarding transit investments should be primarily made either to relieve congestion or to enhance accessibility. We wish here to summarize the results of a series of inquiries into BART’s effects on Bay Area growth and urban form, undertaken as part of the BART@20 project. (Similar studies were undertaken in the mid-1970s as part of the initial BART Impact Study.) We review BART planners’ initial expectations regarding the system’s effects on the Bay Area and ask how transit investments influence urban development. We explore BART’s effects on regional population and employment patterns, residential and office-construction activity near BART stations, the quality of BART’s influence on land use change and redevelopment, and BART’s effects on home prices, office rents, patronage, and retail sales volume. The politicians, planners, and business and civic leaders who advocated building BART in the 1950s and 1960s did so expecting that BART would affect Bay Area development patterns in three related ways. First and foremost, BART would relieve mounting congestion problems on the Bay Bridge and major freeways, thereby insuring San Francisco’s continuing dominance as the economic and political center of northern California. Second, they hoped BART would serve as a structure for the inevitable outward suburbanization of the Bay Area. Rather than decentralizing willy-nilly, as Los Angeles was doing, the Bay Area would evolve into an efficient hierarchy of interdependent urban centers and subcenters, each specializing in some activity essential to the economic life of the region. Downtown San Francisco would stand at the apex of this hierarchy. One level down, Oakland and San Jose would serve as regional centers. One level further down were various subregional centers: Berkeley, San Mateo, Palo Alto, San Rafael, and Walnut Creek. BART would support this structure by linking these centers to each other and to suburban residential areas, creating points of high accessibility that would attract offices, high-density housing, and commerce. In doing so, BART would discourage leapfrog development and urban sprawl, which were regarded as economically and socially wasteful. Third, BART would serve as a catalyst promoting redevelopment and reinvestment in older areas of Oakland, Berkeley, and Richmond, while promoting higher-density residential and mixed-use development in growing suburban jurisdictions. BART’s success in meeting this last objective would depend on supportive land use and redevelopment policies at the local, neighborhood, and station-area levels. In the absence of such policies, BART’s effects on the prospective built form of the Bay Area would be minimal. The processes through which transportation investments like BART affect urban development patterns are reasonably well understood. The principal effect of metropolitan transportation investments is to make previously distant sites more accessible, thereby adding to the supply of developable land within the metropolitan area. Able to purchase land more cheaply and still maintain their prior level of accessibility, households, stores, and businesses respond by moving outward. The resulting competition for suburban land causes site prices to rise above previous agricultural levels but below central city levels. If and when new agglomeration economies arise, usually among complementary land uses, land prices may increase further. Alternatively, rail transportation investments may serve to relieve congestion, thereby maintaining regional accessibility levels amidst continued growth. Because accessibility is typically high near the sites of transportation facilities, rates of decentralization, land use change, and land price hikes should all be highest at the locations closest to the facility itself. For freeways, these high-value locations are at on-ramps, off-ramps, and interchanges; for rail transit systems, such as BART, they are at or near stations. Activities requiring high levels of regional accessibility should concentrate around BART stations. To the extent that sites around BART stations are in limited supply, land prices, housing prices, and office rents near BART stations should be bid upward. Competition for sites around BART stations should cause development densities to increase. As the foregoing suggests, one would expect population and employment growth to favor sites served by BART. To what extent has this actually been so? Contrary to expectations, we found that population has grown faster away from BART than near it (Figure 1). The Metropolitan Transportation Commission divides the nine-county San Francisco Bay Area into 34 transportation planning superdistricts. In the twenty years since BART opened, population grew 35.2 percent in the 25 superdistricts not served by BART and only 17.1 percent in the nine BART-served superdistricts. In Alameda and Contra Costa counties, the population grew three to five times faster, in percentage terms, in areas not served by BART than in served areas. Only in San Francisco was the pattern different. Population grew in the BART-served part of the city while the western half lost some four thousand residents. Outside San Francisco, a similar pattern emerged in employment changes (Figure 2). From 1970 to 1990, job growth mostly occurred away from BART. 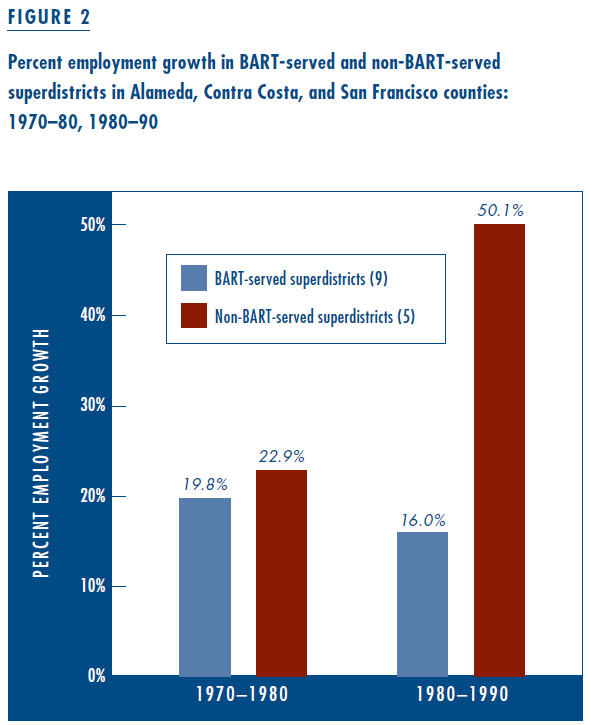 Employment grew 84.5 percent in non-BART superdistricts compared to 38.9 percent in the BART-served ones, mirroring the trend of job decentralization that was occurring throughout the U.S. At the county level, employment grew seven times faster in non-BART portions of Alameda County than in the BART-served portions, and non-BART superdistricts in Contra Costa County added jobs at twice the rate of BART-served areas. Growth percentages can sometimes be misleading: in absolute terms, 153,000 more jobs were created in BART-served superdistricts of Alameda and Contra Costa Counties than in the non-BART superdistricts. A finer-grained analysis of employment growth by zip code showed marked disparities between San Francisco and the other counties for the 1980–90 period according to data at zip code level from County Business Patterns. The 35 zip codes in the three counties with BART stations gained 139,400 jobs from 1981 to 1990, growing by 30.3 percent and accounting for 57.1 percent of employment growth in the three counties. Employment in the 117 non-BART zip codes increased by 110,300, or 19 percent. However, almost all the BART-related employment growth occurred in San Francisco. Jobs in East Bay zip codes by comparison increased just 1.1 percent. We also compared BART and non-BART employment growth differentials by business sector. The two sectors in which employment growth was most consistently concentrated in BART-served zip codes were Finance Insurance and Real Estate (FIRE), and non-Business Services. Even in these two sectors, however, employment growth was hardly uniform: it most favored BART-served zip codes in downtown San Francisco and along the north I-680 corridor. In summary, job growth has been consistently higher around BART stations in downtown San Francisco than elsewhere in the region. In the East Bay, job growth has generally been faster away from BART, especially in the south I-680 corridor. We estimate that approximately four thousand housing units were demolished during construction of BART and related redevelopment projects. Once construction was completed, planners hoped these units would be replaced, and indeed, added to. But it didn’t quite work out that way: disinvestment in housing near BART stations continued well after BART was completed. Between 1970 and 1990, housing units within a quarter-mile of BART stations declined by nearly four thousand units, or roughly–11 percent. In contrast, the number of housing units in BART-served cities grew by 20 percent, and Alameda, Contra Costa, and San Francisco counties together experienced a 25 percent increase. 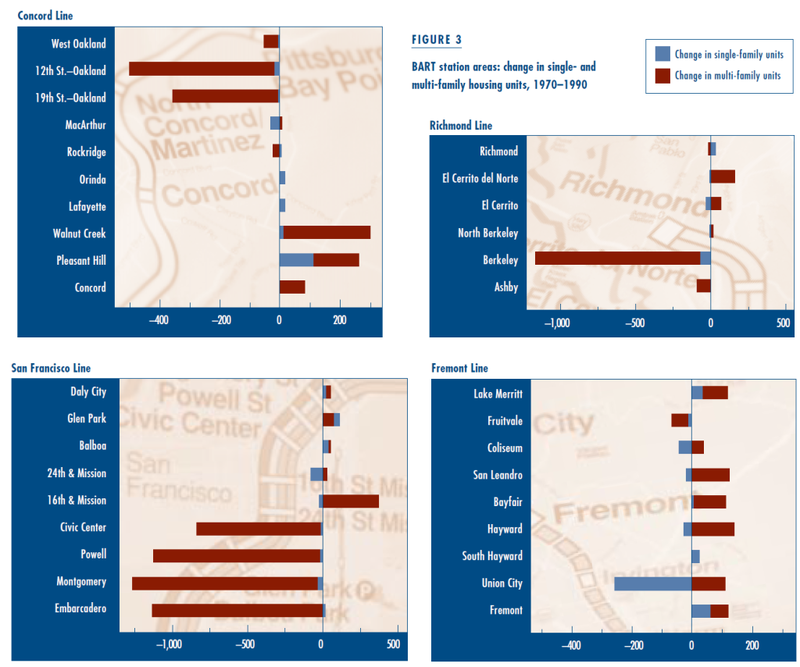 The loss of housing units around BART stations was mostly a downtown phenomenon in Berkeley, Oakland, and San Francisco (Figure 3). Additions to the housing stock, where they have occurred, have been concentrated at suburban stations, along the Fremont line, and near the end of the line. Most gains—as, indeed, most losses—have been apartment units. Property values and congestion levels near BART stations are generally too high, and neighborhood services and amenities too low, to attract single-family homebuilders. Just about everyone agrees that developing housing near BART stations is a good idea. In practice, it has always been a tough sell. Until recently, Bay Area apartment developers were more interested in suburban properties than older urban neighborhoods. 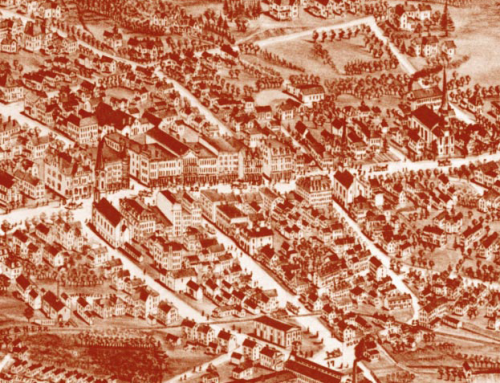 Local general plans and development policies were— and to some extent, still are—indifferent to multi-family housing development. In addition, residents of established single-family neighborhoods around BART stations like North Berkeley and Rockridge have long opposed residential densification of any form. Except at a few isolated stations like Fremont, Pleasant Hill, and now Fruitvale and Castro Valley, opportunities for large-scale residential development have been sparse. Thus, notwithstanding thirty years of demolition and construction, most near-BART housing is what it was and where it was two decades ago. In 1990, apartments comprised about three-quarters of the housing stock at BART station areas, about the same as in 1970. There have been some notable exceptions to the tepid performance of housing around BART. BART’s greatest housing success story is at the Pleasant Hill station, on the Concord line. Until 1988, the Pleasant Hill station was surrounded by a mix of modest single-family homes and open fields. Between 1988 and 1993, over 1,900 housing units were built within a quarter mile of the station—despite the station’s being enveloped by BART’s largest parking lot and lying in an unincorporated part of Contra Costa County. In many situations these conditions would have suppressed land development. Three factors contributed to Pleasant Hill’s turnaround. First, a cogent, specific plan created in the early 1980s served as a blueprint for guiding growth. 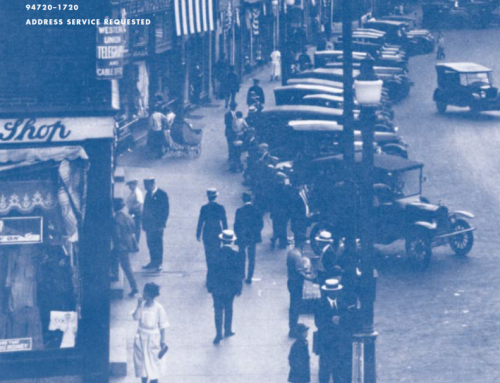 Second, a proactive redevelopment authority aggressively sought to implement the plan by assembling irregular parcels into developable tracts, seeking out private co-ventures, and investing in supportive public infrastructure. Third, a local elected official became the project’s political champion, working tirelessly and participating in numerous neighborhood meetings to shepherd the project through to implementation. During the next eighteen years, another forty million square feet of office space—more than double what was already there— would be built in San Francisco. Nearly three-quarters of this amount would be built in downtown areas, within a quarter-mile of the downtown BART stations, and again with more than half the new supply near the Embarcadero BART station. BART also facilitated development of larger office buildings. The average size of all San Francisco office buildings prior to 1962 was 72,000 square feet. The average size of office buildings constructed between 1963 and 1974 was 365,000 square feet for buildings located within a quarter-mile of future BART stations, but only 208,000 square feet for buildings located beyond the downtown area. As a result of public policies favoring smaller building footprints, office buildings constructed since 1975 have tended to be smaller than buildings constructed in the 1960s and early 1970s. This trend notwithstanding, the average size of new office buildings constructed since 1975 outside BART station areas is only 108,000, less than half the size of office buildings of a similar age located within a quarter-mile of a BART station. BART’s concentrating influence on office development has not extended to the East Bay. In fact, as Figure 5 shows, East Bay office construction during the last thirty years has favored cities lacking BART service. As of 1962, the East Bay office inventory totaled about 3.7 million square feet. Of this total, about two-thirds was located within a half-mile of proposed BART stations in downtown Oakland, Berkeley, Walnut Creek, Concord, and Fremont. 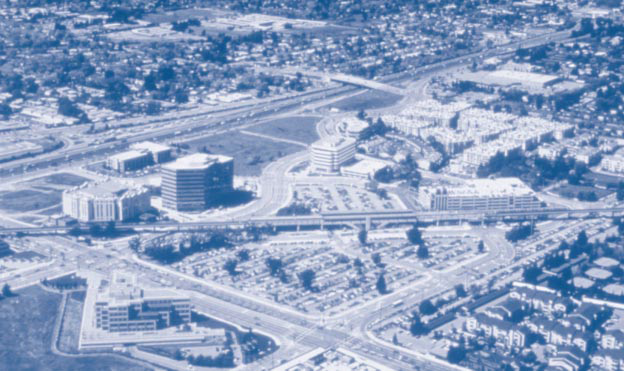 Of the 5.4 million square feet of new East Bay office space built between 1962 and 1974, only about a third was located within a half-mile of proposed BART stations. Of the sixty million square feet of new office space constructed in Alameda and Contra Costa counties between 1975 and 1992, only 15 percent was located within a quarter-mile of a BART station. Indeed, most of the new office space constructed in the East Bay since 1975 is located adjacent to freeway interchanges. Why did BART help concentrate office development in San Francisco, but not in the East Bay? The answer to this question illustrates the crucial role of local planning and development policies in shaping the effects of transit on urban development. Remember that San Francisco political and business interests had always viewed BART’s development as a tool for maintaining the city’s regional primacy. The San Francisco Redevelopment Agency has long worked toward the same end. As part of its ongoing redevelopment efforts, it cleared vast amounts of land along the Embarcadero during the 1950s and 1960s. Large parcels suitable for modern office buildings were thus available for development right at what would become San Francisco’s premier BART station. More recently, San Francisco officials and citizens have adopted a succession of public policies aimed at concentrating office development in the downtown area and preventing its intrusion into residential neighborhoods. The first such policy was the Downtown Plan, adopted by the Board of Supervisors in 1985 and subsequently followed almost to the letter. The Downtown Plan was followed in 1986 by the passage of Proposition M, a citizen initiative limiting annual office construction to 400,000 square feet, thereby forcing office developers to compete for allotments. The ratings system adopted by the city for evaluating competing office development proposals strongly favors downtown locations. This has had the effect of making downtown sites even more valuable. Taken together, these three policy initiatives: site clearance and land assembly, downtown-oriented commercial zoning (later augmented with development incentives), and the construction of a supporting transportation infrastructure (BART) have successfully prevented office development from decentralizing within San Francisco. While BART has clearly helped downtown San Francisco maintain its economic vitality, its relationship with downtown Oakland is more complicated. During BART’s first ten years, virtually no new buildings were built around downtown Oakland’s three stations. Things changed markedly since the early 1980s, thanks mainly to the construction of Oakland City Center, an ambitious office-retail complex built atop and linked to the 12th Street BART station that has received several design awards. Credit for City Center belongs jointly to the Oakland Redevelopment Agency, which provided a combination of land assemblage, tax increment financing of public infrastructure, securing federal urban renewal grants, subordination of loans, and equity participation (including majority ownership of a downtown convention hotel); and Bramalea-Pacific, a private development company that is headquartered in Toronto and thus familiar with transit-oriented downtown development. Altogether, more than 1.6 million square feet of new office space (about 30 percent of the city’s inventory) has been constructed in downtown Oakland since 1983. While this is certainly less than the volume of office space constructed in downtown San Francisco, it is probably more than would have been constructed in the absence of BART. Ironically, these same policies helped to promote office decentralization outside of San Francisco. As downtown San Francisco office rents rose, partly in response to Proposition M construction caps and partly because of the inconvenience and high cost of development downtown, more and more office tenants began looking elsewhere in the region for office space. These tenants found cities with excess highway capacity, plentiful supplies of developable land, relatively liberal zoning and land use policies, and a yen to become a suburban office center. In the absence of a regional growth-coordinating agency, cities began competing with each other for commercial development. Oakland, the one other city in the region well-positioned to use BART to catalyze downtown development, was unable to attract significant new office development. Instead, office developers and office tenants turned their attention to the Interstate 680 corridor in central Contra Costa County. The northern part of this corridor, the area between downtown Walnut Creek and downtown Concord, was served by BART. The southern part, from Danville to Pleasanton, was not. Except in downtown Walnut Creek—and even there, not until the mid-1980s—BART service was not a significant inducement to office developers. Although BART has clearly had some localized influence on development activity at some stations, how far that influence extends and whether it has been systematic remain open questions. To gain a clearer understanding of BART’s influence, we developed a series of statistical models of land use change in Alameda and Contra Costa counties between 1985 and 1995. (There were too few instances of land use change in San Francisco County.) The models track ten-year changes at the one- hectare (100m by 100m) site level. We evaluated five types of undeveloped land use change and four types of redevelopment: no change in undeveloped land; change from undeveloped land to single-family residential use; change from undeveloped land to multi-family use; change from undeveloped land to commercial use; no change in developed land use; redevelopment from nonresidential to residential use; redevelopment from noncommercial development to commercial use; and redevelopment from nonindustrial development to industrial land use. These changes were compared with more than twenty predictive factors, such as the distance from each one-hectare site to the nearest BART station and freeway interchange. Altogether, more than 13,000 hectares of land in Alameda and Contra Costa counties changed use between 1985 and 1995. 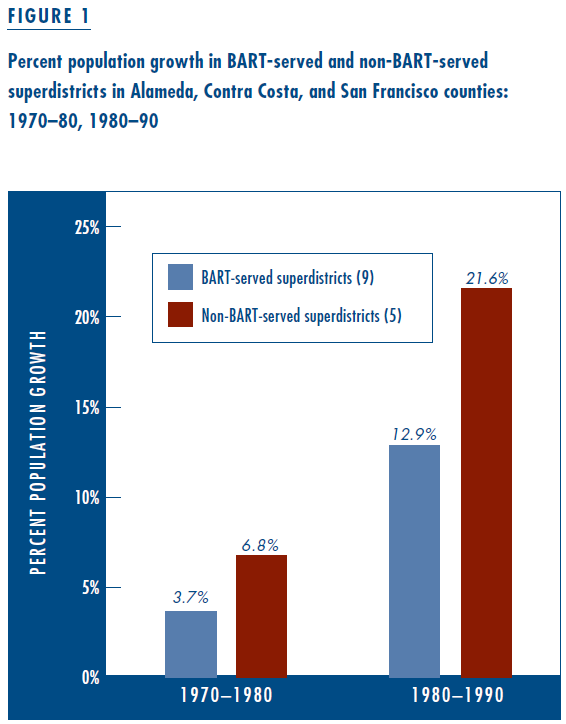 BART’s influence on 1985–95 land use change in the two counties turned out to be minor and uneven. In Alameda County, proximity to a BART station reduced the likelihood that a vacant site would be developed in either single-family use or commercial use and had no effect on multi-family or industrial development. In Contra Costa County, the closer a vacant site was to a BART station, the less likely it was to be developed in any use. BART’s effect on redevelopment activity was even more varied. In Alameda County, proximity to a BART station increased the likelihood that a site would be redeveloped to commercial or industrial use, but not residential use. In Contra Costa County, proximity to a BART station had no effect on redevelopment. BART’s lack of influence stands in marked contrast to the effect of freeway interchanges. Among undeveloped Alameda and Contra Costa sites in 1985, proximity to the nearest freeway interchange exerted a strong negative effect on single-family development, a strong positive effect on commercial development, a strong positive effect on industrial development in Alameda County, and a weak negative effect on Contra Costa County industrial development. Proximity to a freeway inter- change exerted a negative effect on residential redevelopment in Alameda County, a positive effect on Alameda County commercial redevelopment, and a negative effect on Contra Costa County industrial development. The process by which transportation investments influence property values is known as capitalization. To what extent has BART service been capitalized into residential property values and commercial rents? Proximity to transit is only one of many possible factors affecting housing values. Others include the size, age, and structural characteristics of the individual house; the location of the house vis-à-vis regional employment and service centers; the quality of the neighborhood and neighborhood services (especially schools); and accessibility via automobile. Proximity to any sort of transportation facility is a double-edged sword. On one hand, properties located near or adjacent to highways and rapid transit lines usually have excellent accessibility. On the other, homes located right next to major transportation facilities also suffer from noise, vibration, and, with highways, localized concentrations of pollution. Homes located away from transportation facilities can avoid such problems, but must sacrifice accessibility. To test these propositions, we compared 1990 prices and characteristics among a sample of 2,360 home sales in Alameda and Contra Costa counties. We used a geographic information system (GIS) to address-match each transaction to its street address, and then measure its distance to the nearest BART station and the nearest freeway interchanges, and determine whether or not it was within 300 meters of an above-ground BART line or freeway. All else being equal—that is, controlling for house size, age, number of bedrooms and bathrooms, income in 1989, neighborhood ethnic makeup, and being directly adjacent to a BART line or freeway—homes near BART stations in Alameda and Contra Costa counties sold at a premium, while homes near freeway interchanges sold at a discount. For every meter closer an Alameda county home was to the nearest BART station (measured along the street network), its 1990 sales price increased by $2.29. For Contra Costa homes that sold in 1990, the sales price premium associated with the nearest BART station was $1.96 per meter. The opposite effect held for freeway proximity: Alameda and Contra Costa homes near freeway interchanges sold for less than comparable homes elsewhere. For every meter it was closer to a freeway interchange, the 1990 sales price of an Alameda county home declined $2.80. The per meter discount associated with highway accessibility was even greater in Contra Costa County: $3.41. These findings are subject to three caveats. First, as significant as they are, these transit premiums are not large enough by themselves to promote redevelopment or increased residential densities. Supportive land use policies and, where appropriate, subsidies and incentives, are also necessary to encourage residential upgrading. Second, the existence and magnitude of a station-access capitalization effect is by no means a sure thing. A similar analysis of houses near Sacramento and San Jose light-rail stations and San Mateo CalTrain stations failed to identify any such premiums. Furthermore, the fact that a BART-access premium existed in the East Bay in 1990 does not mean that home values were correspondingly higher in every home in every neighborhood near a BART station. In neighborhoods suffering from weak housing demand, or where the quality of the housing stock is poor, there may well be no additional value associated with transit access. We used a similar approach to investigate the influence of BART service on office rents. We compared differences in 1993 office-building rents and vacancy rates in Alameda, Contra Costa, and San Francisco counties as a function of proximity to the nearest BART station. We culled listings for individual office buildings from Black’s Office Leasing Guide: 1993 (San Francisco Bay Area edition), and matched addresses to their appropriate street locations. BART proximity was measured using concentric rings of 1/8, 1/4, 3/8, and 1/2 mile around each BART station, except in downtown San Francisco, where it was measured using 1/8 and 1/4 mile rings only. A tale of two efforts to build suburban centers at suburban rail stations. Top, Ballston, Virginia, on the Washington Metro’s Orange Line, one of several similar subcenters there. Bottom, Pleasant Hill, California, on BART’s Concord Line, the largest new development at a previously greenfield station site. If indeed office tenants do value accessibility to BART, then one would expect to find higher office rents for buildings closer to BART stations. 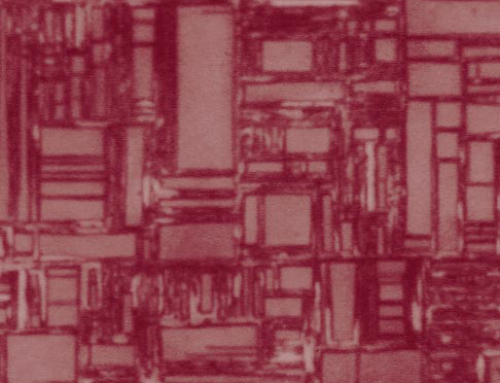 Figure 6 shows that no such pattern is evident. If proximity to BART makes a building more attractive to potential tenants, then one would also expect to find higher occupancy rates for buildings closer to BART stations. To a limited extent, this was indeed the case in 1993—especially for the two BART stations in San Francisco’s financial district. When we looked more closely we found the higher occupancy levels associated with BART instead reflected improved building quality, not access to BART. These results confirm the observations of many commercial brokers: that office space is increasingly becoming a commodity and that rents follow the ever-changing balance of supply and demand and building characteristics more than location. BART was planned and constructed before the idea that transit stations should serve as neighborhood retail centers, or “transit villages,” became as popular as it is today. Food is not allowed in BART stations or on BART trains, and no BART station includes significant internal retail space. Even at El Cerrito Plaza and Bayfair, the two BART stations which directly serve regional malls, station-shopping access is not as good as it could be. These problems notwithstanding, there is a substantial amount of retail activity close to many BART stations. Major new retail projects have been developed adjacent to the Rockridge, Oakland-12th Street, El Cerrito del Norte, and Powell Street BART stations, and others are currently planned for the Fruitvale and Pleasant Hill BART stations. How have the stores located at or near BART stations fared? Does being near a BART station boost customer traffic or sales? And are there any disadvantages to locating near a BART station? Lacking area or retailer-specific information on retail sale volume, we developed and administered a brief questionnaire to all retailers located within a quarter-mile of twelve BART stations. The majority of respondents (54 percent) were long established at their current near-BART locations. Only 14 percent had been in business at their current (BART) locations for less than a year, while another 32 percent had been in business at their current locations for one to five years. Close proximity to BART had been a very important consideration in their initial location decision, said 23 percent of respondents. Another 32 percent reported that BART proximity had been somewhat important. But an even larger number— 45 percent—said that being near BART had not been a major consideration in their choice of location. Opinions also varied widely regarding the contribution of BART to retail sales. Sample-wide, 14 percent of survey respondents believed BART contributed positively to their sales. Another 51 percent cited BART proximity as being only somewhat important to their business and sales, and one-third cited BART as having no effect. Furthermore, the longer retailers had been in business near BART, the less positively they viewed BART’s contribution to sales. Few weekday BART riders actually shop near BART stations—at least according to the survey respondents. Some 55 percent calculated that fewer than one in ten BART riders actually shopped at their stores. 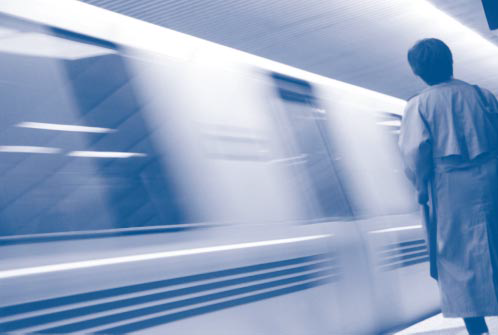 Only 7 percent thought that local BART riders comprised more than half their customer base. Restaurants and food stores were more likely to capture BART patrons than service businesses. Forty-four percent of respondents cited customer and employee convenience as the primary advantage of being located near a BART station. 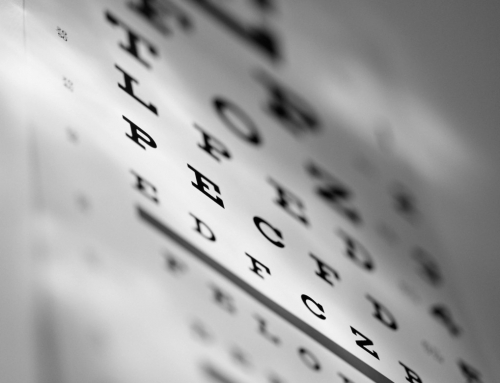 Another 39 percent listed more customers as a major advantage. Greater visibility, additional pedestrian traffic, and BART’s role as an area landmark were listed as major advantages by 20 percent, 15 percent, and 11 percent of respondents, respectively. Merchandise retailers perceived more advantages to being near BART than did restaurants, food stores, or service businesses. On the other hand, almost a third of the survey respondents didn’t list any disadvantages associated with being located near BART, although one-third cited the presence of “unwelcome people,” and 22 percent cited reduced safety and security as key concerns. Merchandise retailers perceived more disadvantages from being located near BART than did other businesses—just as they also perceived more advantages. Retailers who had been in business a long time were neither more nor less likely to find specific faults than were retailers who had just opened up. The story of BART and its effects on the metropolitan landscape of the Bay Area is complicated—composed of one very big achievement, several smaller successes, and many missed opportunities. BART’s major achievement has been to link downtown San Francisco with the growing suburbs of central Contra Costa County. This has allowed San Francisco to maintain its preeminence as the business and financial center of the Bay Area, even as regional auto use and traffic congestion have increased many times over. On a more modest scale, BART has helped spark new commercial and residential development around several suburban stations, most notably Walnut Creek, Pleasant Hill, Concord, and Fremont. There have also been some notable failures. So far, BART has not triggered hoped-for levels of reinvestment in downtown Berkeley, Oakland, or Richmond. BART’s land use effects on the Richmond and Fremont lines as a whole have been much less than were expected. Except for the Rockridge station in Oakland, BART has done little to encourage new retail development. There are many reasons why BART’s land use and development effects have to date been so modest. BART is essentially a commuter railroad, and the fact that most suburban BART stations are either surrounded by parking lots or in freeway medians has made nearby development difficult. In Berkeley, El Cerrito, and parts of San Francisco, neighborhood groups have long opposed more dense development around BART. Site assembly and financing difficulties combined with a lack of commercial demand have stifled station-area development along the Fremont line. BART has long insisted that new station-area developments provide free replacement parking, but that renders many projects economically infeasible. In short, the accessibility benefits from BART as capitalized into station-area land values have not been sufficient to overcome either weak local real estate markets or entrenched opposition to development. Might things be different in the future? The success of the BART Rockridge station as well as recent evidence from Portland indicate that there is a large untapped market for quality, mixed-use residential development within walking distance of regional rail transit. 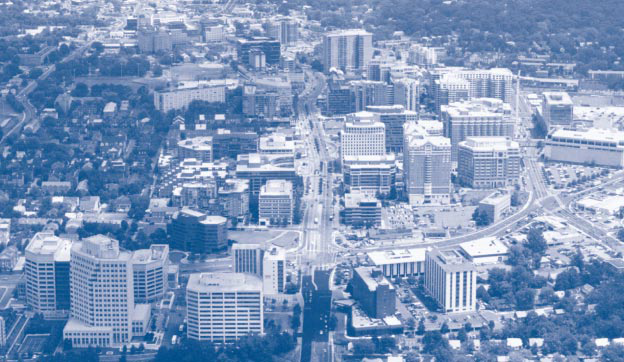 Successful experiences in metropolitan areas like Washington, D.C. and San Diego suggest that transit can be a catalyst to development where local governments, imaginative private developers, and transit agencies are able to work cooperatively together to overcome site assembly, design, financing, and entitlement barriers. Overall, our findings confirm that the land use benefits from investments in rail transit are not automatic. 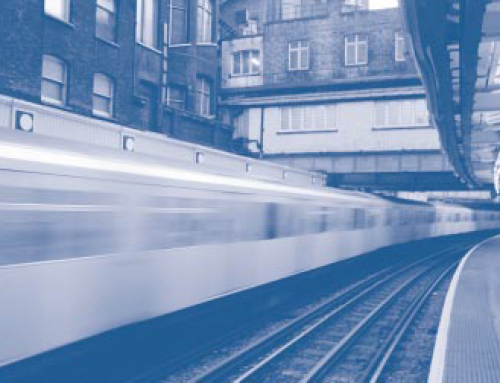 Rail transit can contribute to positive change, but rarely creates change by itself. The hardware needs software—supportive land use policies such as density bonuses and ancillary infrastructure improvements—if it is to reap significant dividends. 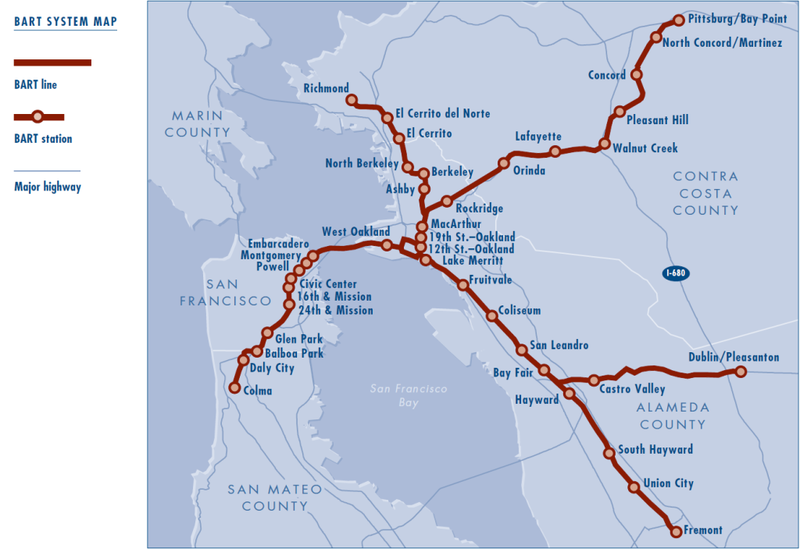 BART is presently embarking on the largest expansion program in its history, with some 25 miles of suburban extensions at various stages of planning and completion. The degree to which Bay Area localities attempt to leverage BART’s gift of improved accessibility will determine the land use effects of both existing and future investments over coming years. We trust there will be a BART@50 study to see if we are right. Blayney Associates/David M. Dornbusch & Co., Inc., Land Use and Urban Development Impacts of BART (San Francisco, CA: Metropolitan Transportation Commission, 1979). Robert Cervero, “Rail Transit and Joint Development: Land Market Impacts in Washington, D.C. and Atlanta,” Journal of the American Planning Association 60 (1): 83–90. 1993. Robert Cervero and John Landis, “Twenty Years of BART: Land Use and Development Impacts,” Transportation Research 31 (4): 309–333. 1996. John Landis, Subrajit Guhathakurta, Ming Zhang, and William Huang, “Rail Transit Investments, Real Estate Values, and Land Use Change: A Comparative Analysis of Five California Rail Transit Systems,” UC Transportation Center/ Berkeley Institute of Urban and Regional Development, Monograph 48. 1995. Melvin Webber, “The BART Experience: What Have We Learned?” The Public Interest 45. 1976. 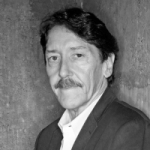 John Landis is Professor of City and Regional Planning at the University of California, Berkeley (jlandis@berkeley.edu).